How can I have tax payments for a 1040 return, including federal estimated tax payments, directly debited from a checking or savings account? State estimated tax payments cannot be made using only the PMT screen. Note: A few states allow debits for ES payments, and some do not. If unsure, you may want to check the states FAQ page in Data Entry, or the form instructions. If the states do allow ES Payments, they may be set up in the ES screen. See Related Links below. a state balance due. For multiple states, select A in the State/City Selection drop list for all states with a balance due. Account #2 and Account #3- secondary and tertiary accounts for payment only of a state balance due. A primary account payment (either Federal or state or both) must be set up before you can use these accounts. Note: Always check the results from the PMT screen before transmitting a return. After setting up a payment, go to View, examine the Transaction Summary and Payment pages (DD_PMT and PAYMENT pages in Drake15 and prior) and confirm that the correct debits and debit accounts are reflected there. After a return is accepted, the payment information can be cancelled by contacting the IRS or state DOR, but it cannot be changed. 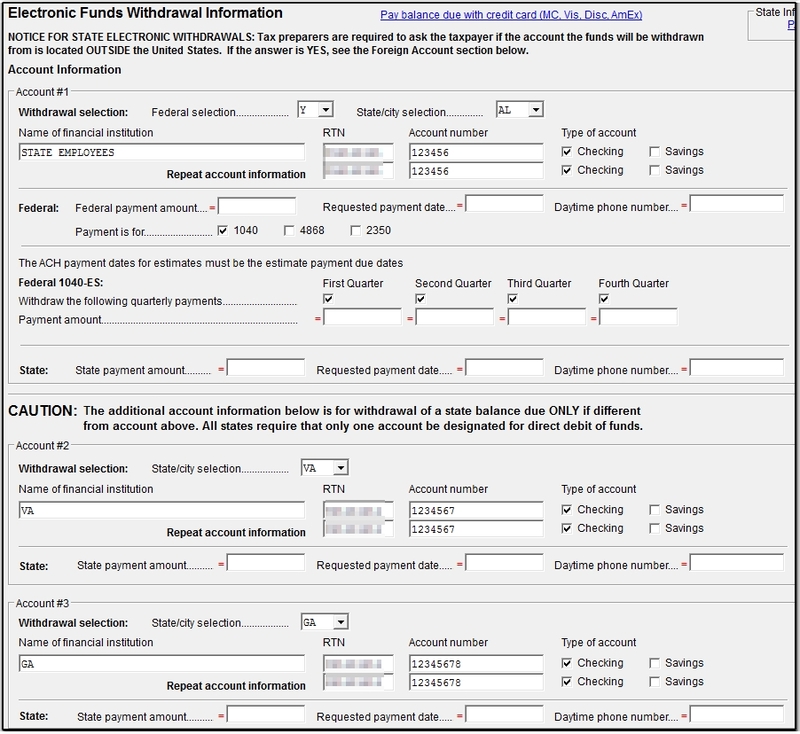 Use of the PMT screen is described below: how to set up payment of a Federal balance due, Federal estimated tax, or a State balance due. 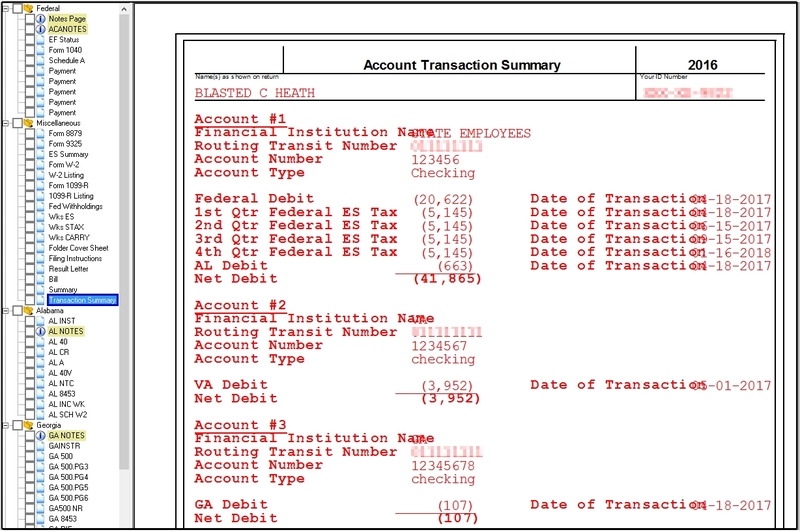 An example of a completed PMT screen is provided at the bottom of this article - the example screen pays a Federal balance due, Federal estimated tax, and a balance due for three states. Setting up Payment for a Federal Balance Due. Complete Account #1 as follows. Federal selection drop list. Select Y (you can make this selection with or without a State/City selection.) If this field is left blank, no error is produced to prevent e-filing, but the Federal debit will not be made. Name of financial institution. Enter the name of the bank or financial institution from which to withdraw the balance due. RTN. Enter the nine-digit bank Routing Transit Number (RTN). Account number. Enter the taxpayer's bank account number. Type of account. Select Checking or Savings. Repeat account information. Reenter the RTN, Account number, and Type of account entries to confirm them. These entries must be made and must match your initial entries. Payment is for. Select 1040, 4868, or 2350, depending on the form to which the payment applies. Optional overrides. These entries are optional, except the payment date when filing after the return due date (see "PMT Screen Reject FPYMT" in Related Links below). Federal payment amount. The amount owed on the return or extension is the default for this field. Use this override field to change the amount. Requested payment date. Default is the due date of the return. This date cannot be prior to five days before the current date. If the return is transmitted to the IRS on or before the due date in the current processing year, the Requested Payment Date cannot be later than the due date. If the return is transmitted to the IRS after the due date, the Requested Payment Date cannot be later than the current date. Daytime phone number. Default is the taxpayer's daytime phone number from screen 1. Use this override field to provide a different number for purposes of payment. Federal selection drop list. Select either Y (to pay both a Federal balance due and estimated tax) or E (to pay only Federal estimated tax and not a Federal balance due). Select 1040 at Payment is for. Estimated payments are not transmitted for an extension, either 4868 or 2350. Omit the rest unless needed for a federal balance due payment. Withdraw the following quarterly payments (required). Select the quarters for which ACH payment is to be made. You cannot override the payment dates - payment is scheduled on the quarterly due date. Payment amount (override). Default for these fields is the calculated (or entered) estimated payments from the ES screen. An ES Code must be selected on the ES screen for payments (entered or calculated) to be made through the PMT screen. ​Estimated Tax Payments must be setup and e-filed with the 1040. If the return has already been e-filed and Accepted, you can make ES payments through 1040paytax.com or IRS.gov Payment Options center. Setting up Payment for a State Balance Due. Account #1 can be used for a state payment with or without a Federal balance due or Federal estimated tax payment. If any payment is set up for Account #1 (state, federal, or both), you can also use Account #2 and Account #3 for additional state payments. The State/City selection described below can be used to specifically select a state or city for payment, or to select All State or City ELIGIBLE tax types not included elsewhere. The latter selection does not cover any eligible state or city that you have specifically selected in another account on the PMT screen. Complete Account #1 as described above for a Federal balance due, except as noted below. Federal area. Omit these fields unless needed for a federal balance due payment. State area. These fields are overrides. See the Help screens in these fields (press F1) for more information. State payment amount. Default is the state balance due. Requested payment date. Default for most states is the return due date. Complete Account #2 and Account #3 as needed for payment of additional state balances due only if withdrawing from a different account, or overrides are needed. Federal payments cannot be made from these accounts. 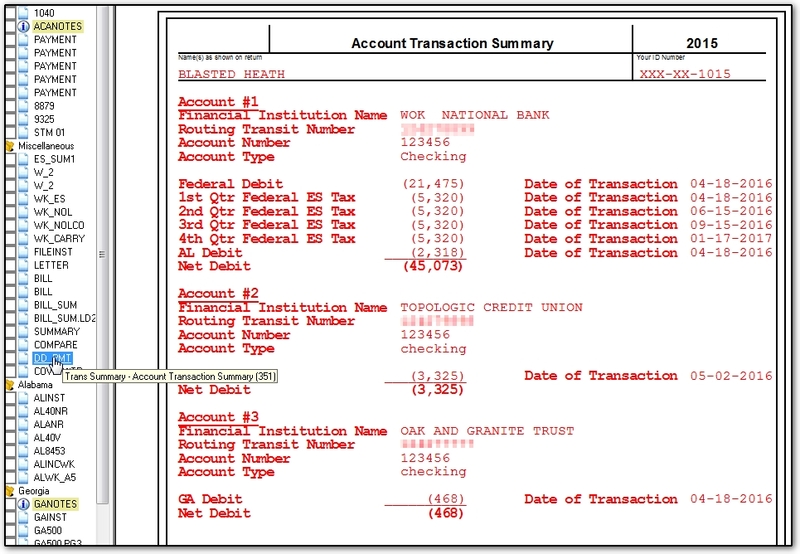 Example of a completed PMT screen where each state is being withdrawn from a different account. Note: the first account section Account #1 may be used to withdraw all state payments if taken from the same account - use A for the state/city selection. Can I use a federal refund to pay a state balance due? Can I use a state refund to pay all or part of a federal balance due? If the federal return has a refund and the state has a balance due (or the state has a refund and federal has a balance due), there is no way to re-direct the refund to the other taxing authority in order to pay the balance due (amount due).